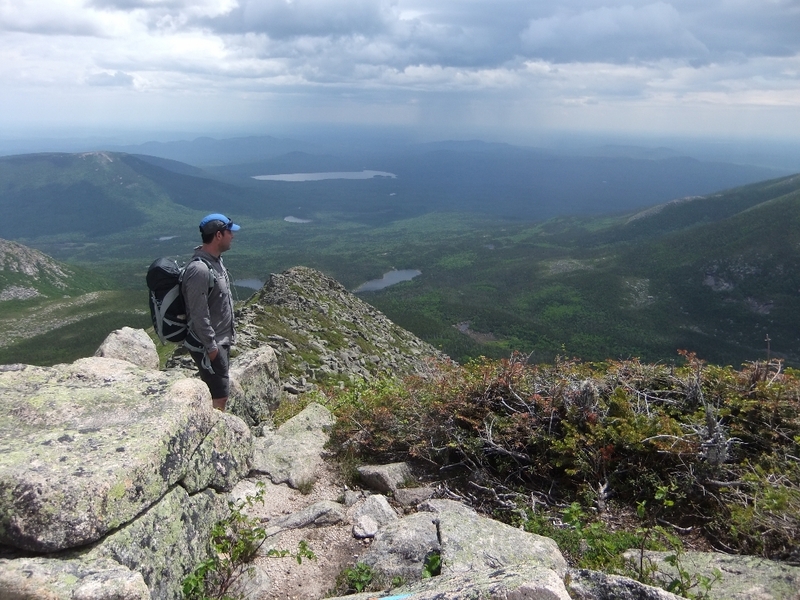 We had heard about Baxter State Park, that Hunt trail was the northern terminus of Appalachian trail, that Mount Katahdin was the highest point in Maine and that it had the famous Knife Edge trail, but it was realizing that the park was only about 7 hours drive from Halifax that sealed the deal. We started by borrowing a map from a friend and speaking to everyone we knew who had been to the park (thanks Val, Jim and Heather). 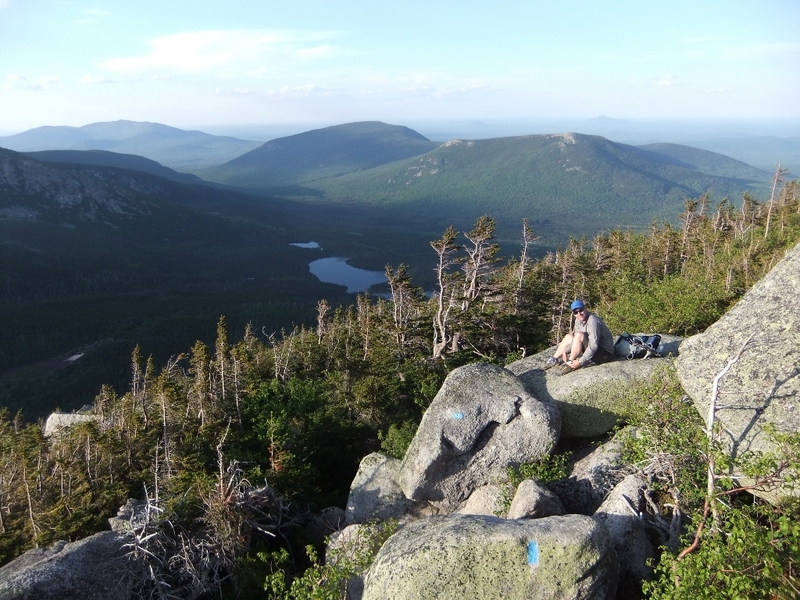 We called the park office a few times for extra information and had mapped out a tentative route and booked campsites at Chimney Pond and Davis Pond. Heather was driving to New England in May of that year and decided to spend a night in the park enroute. That meant we would be able to obtain a hard copy of the official park guide (updated in 2012) and gain some additional insight from park staff (and a few hikers Heather encountered on the trail). We were planning on a morning start, so had to decide where to spend the night before we set out. Our options were a hotel (more expensive but easy), camping outside the park (hot showers but required a second set of camping gear to avoid having to repack), or staying in the park (this would give us the earliest start but no running water and we’d have to leave food waste in the hot car for the rest of the trip). We chose the second option (Big Moose Inn, Cabins & Campsite), located about 20 minutes from the South gate, which worked out well. 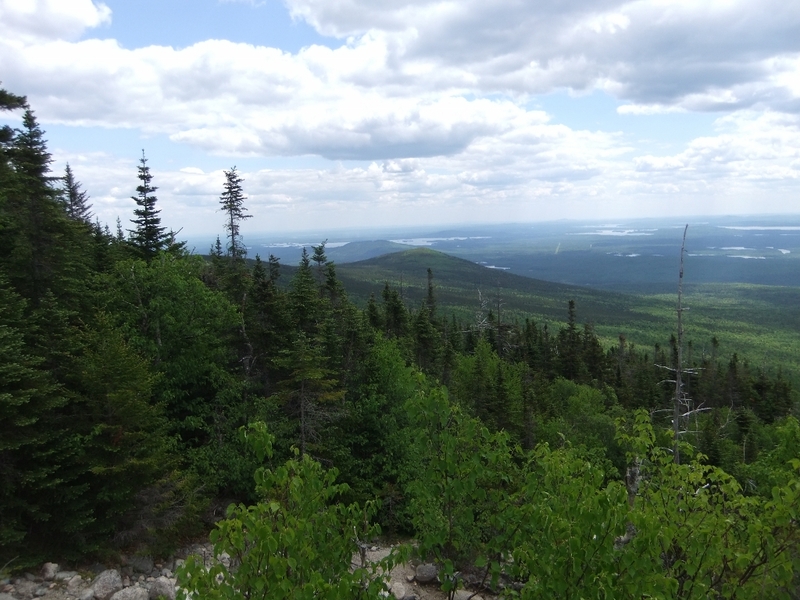 Our route was along the Park Tote road to Abol campground, up the Abol trail to the tablelands, along the Hunt trail to Baxter Peak, across the Knife Edge and down Dudley trail. It was mid-morning by the time we finished checking in, speaking to the ranger to confirm parking, and making the final preparations. 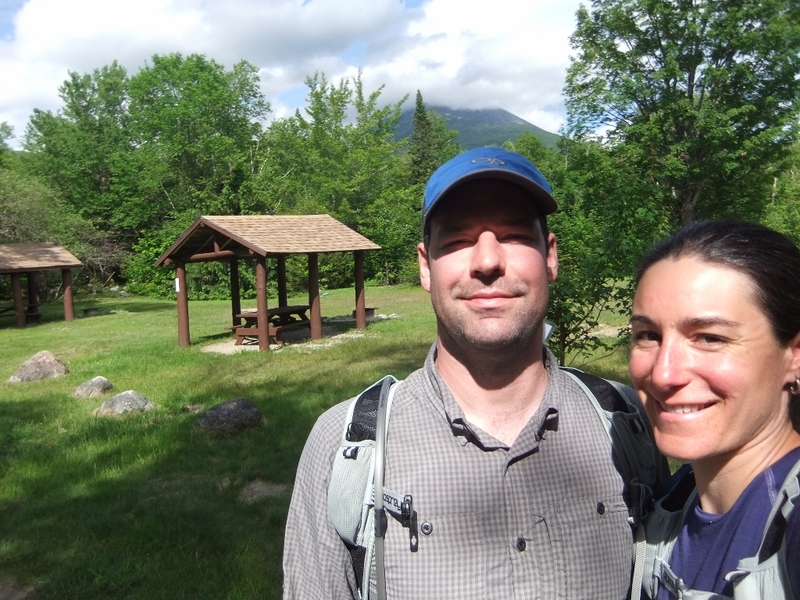 We set out from Katahdin Stream campground in the sun, though the mountain tops were still shrouded in clouds. We had passed the entrance to Abol campground along the way, and were not looking forward to walking back along the same road, though it was what allowed us to make a loop (well figure-eight actually) and we both agreed it was better to get it out of the way at the beginning rather than the end of the trip. 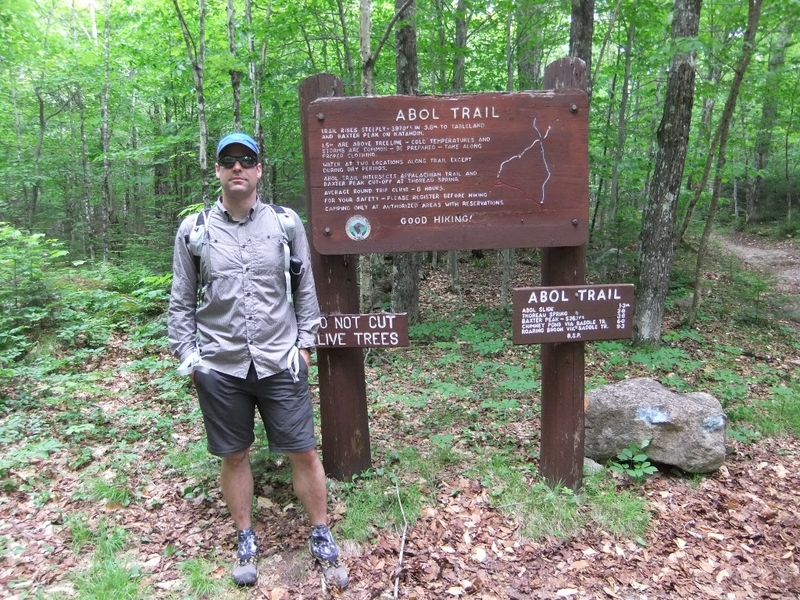 After the walk up the Park Tote road, we made it to the Abol campground and prepared ourselves to start the climb. In retrospect, the walk along the road was a nice warm up for what was about to come next. 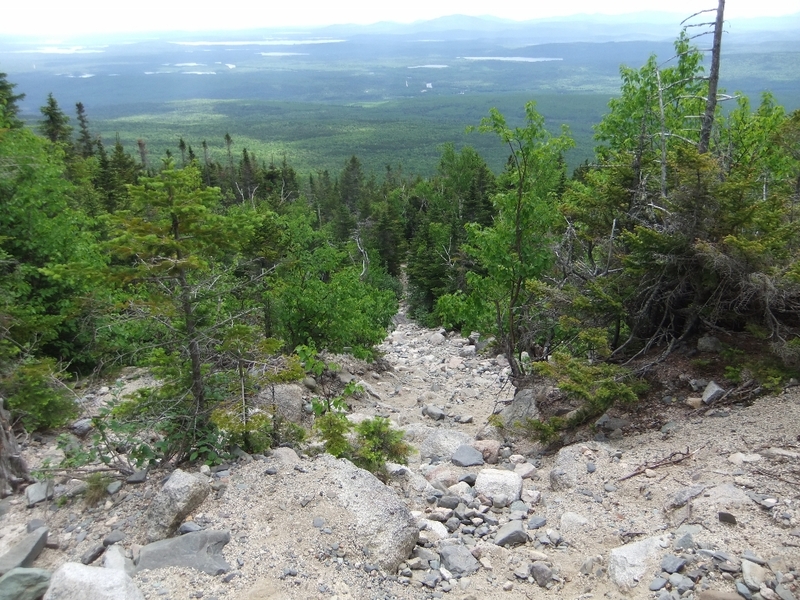 The climb starts quite abruptly soon after you leave Abol campground, and it was steep and steady. It was hot as we had unfortunately timed the steep part of the climb with mid-day sun. We knew water would be scarce this day and we were grateful to have taken the time to confirm water sources with the rangers before heading out. Below is the first of our views down from the mountain, though we definitely did not appreciate how much more dramatic the views were about to become! Soon after, we entered the “slide” part of the trail. Photographs just never do justice. 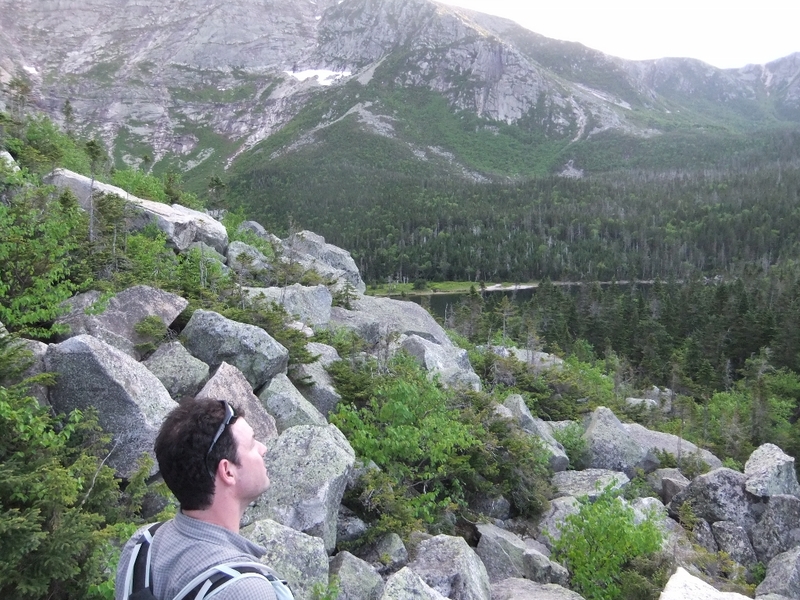 And here are our first truly spectacular views, though the haze diminishes the true effect. And just when you thought it would never come, the top comes into view, just a few feet above you. On to the tablelands! A completely different and foreign landscape with marked trails (wooden posts tied with string) to keep hikers on the trail to prevent destruction of the fragile vegetation. 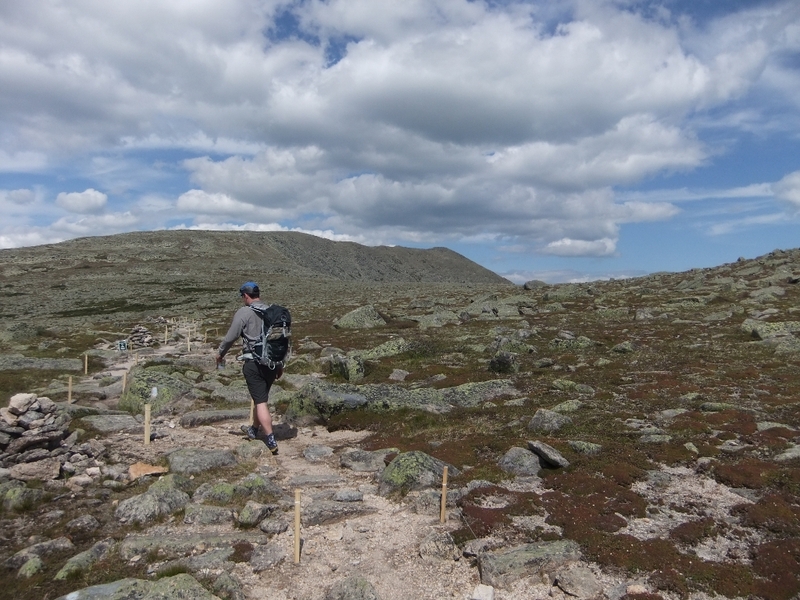 A gentle walk along the tablelands brought us up to the summit. Pretty sure we were happier than we look in this photo. 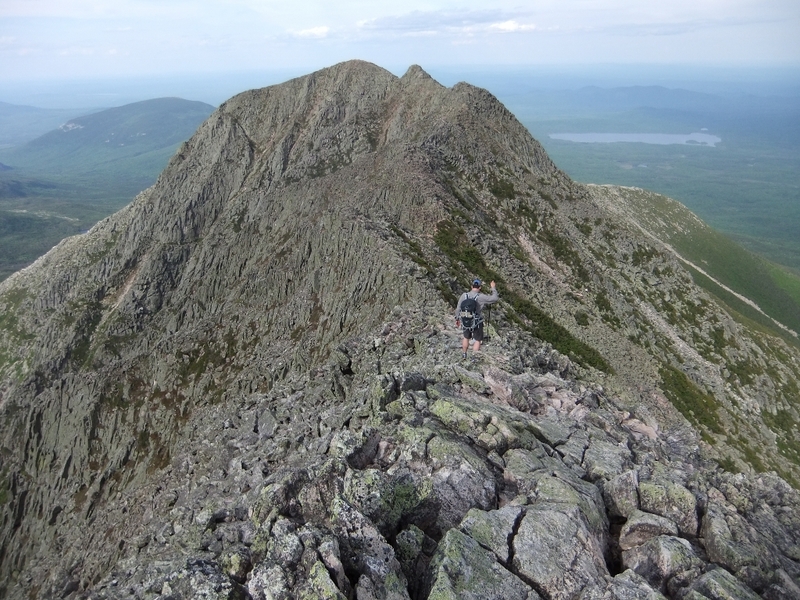 And right beyond the summit, our first views of the Knife Edge and top of Dudley (before it plummets), where we’d be heading down to Chimney Pond. And it soon became clear why he said that. 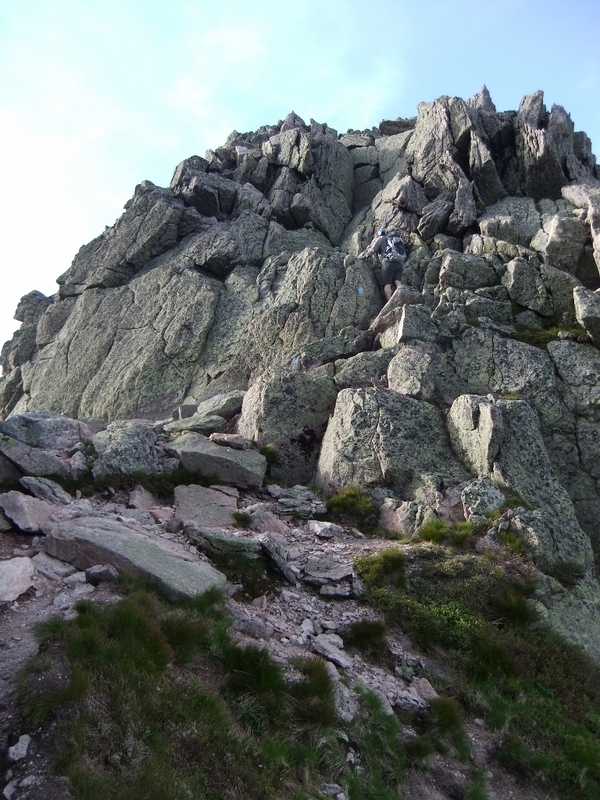 South Peak over to Pamola has a few steep up and downs with plenty of scrambling and narrow ridges. Can you see Wade in the photo below? We made it across in near-perfect conditions without much difficulty. 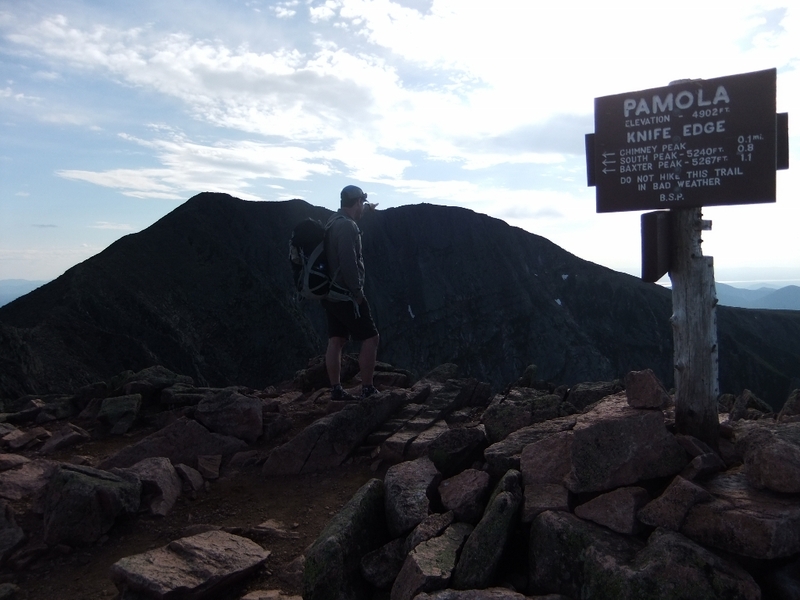 Even on a day like this, the Knife Edge trail is not for everyone, and we saw quite a mix of hikers. There was the man in jeans and white tennis shoes strolling along whistling with hands in pockets, while seemingly oblivious to his white-knuckled wife crawling over the rocks behind him. There was also a six(?) year old girl in jammies walking alongside her parents as a crowd of slightly older kids raced ahead to the peak. 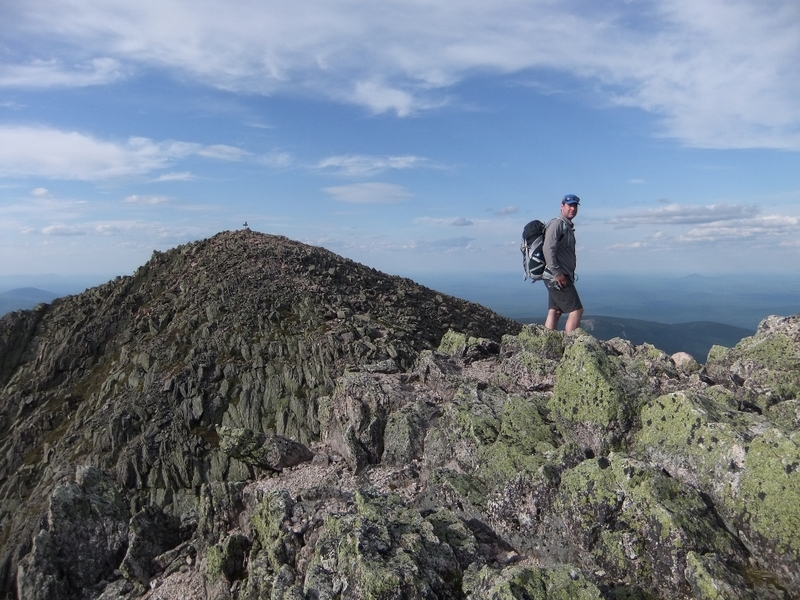 Here is Wade pointing back toward Baxter peak. A few patches of snow/ice are still visible on the shaded side of the mountain. We started down Dudley pleased that the end was near. We had reviewed the guidebook in detail and looked at the contour lines on the maps, but somehow we were still not prepared for the difficulty of the descent. Taking a well-deserved break on the way down. 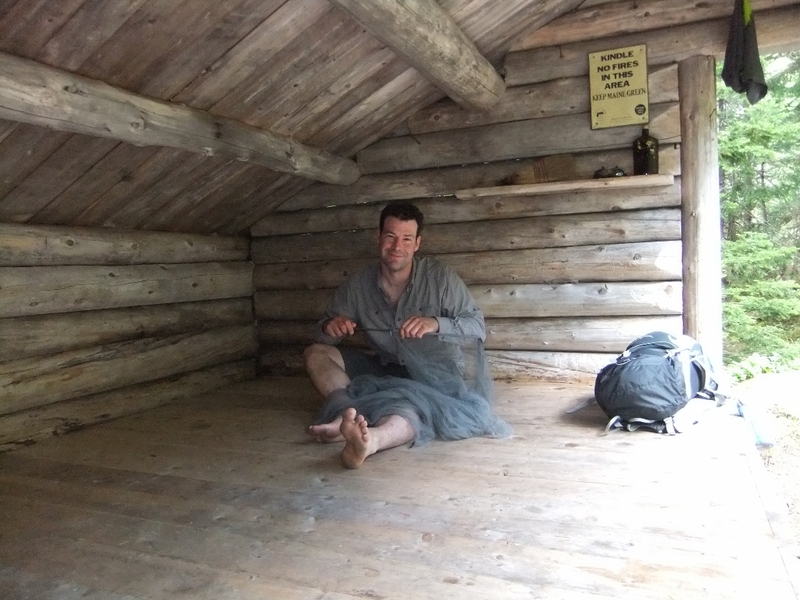 We were pretty exhausted when we arrived at Chimney Pond but ended up standing in the Ranger’s Cabin for almost an hour talking to Ranger Mark. 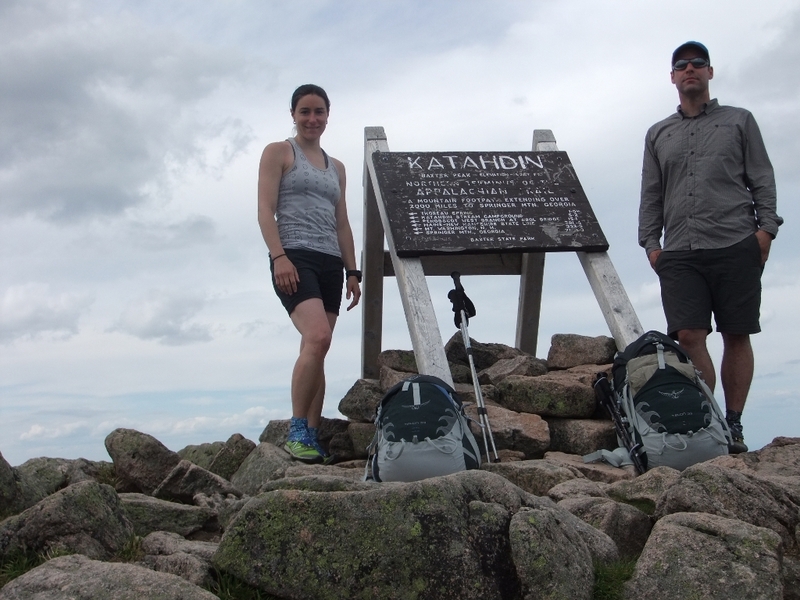 This was our first experience with one of Baxter’s backcountry rangers and they are pretty exceptional people. He wanted to make sure we knew exactly what we were planning to do and that we were prepared to be safe doing it. We listened to the weather forecasts and he gave us a ton of important information. We spent a little extra time because we were planning to leave in the morning before he would have time to post the updated weather forecast. 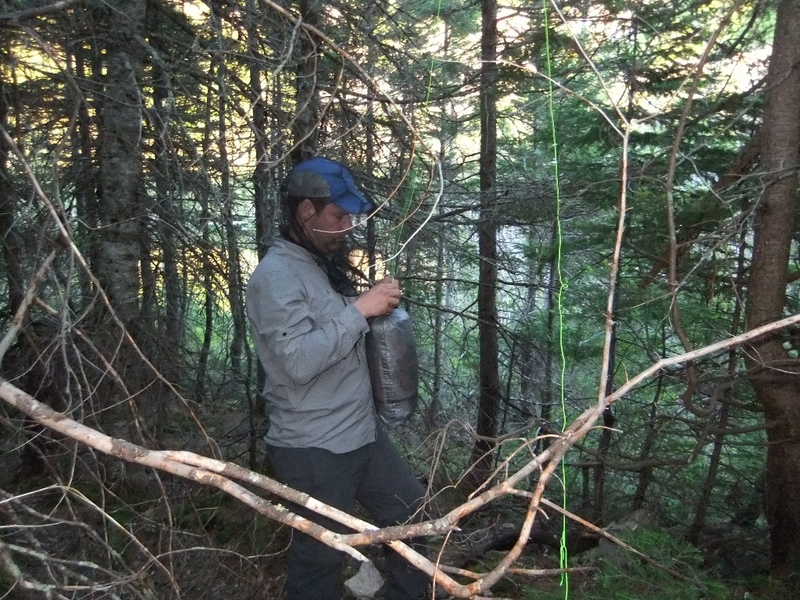 We had just enough energy left to grab some water, make supper, and fall into our lean-to. But not before stopping for a few moments to appreciate sunset over the pond. 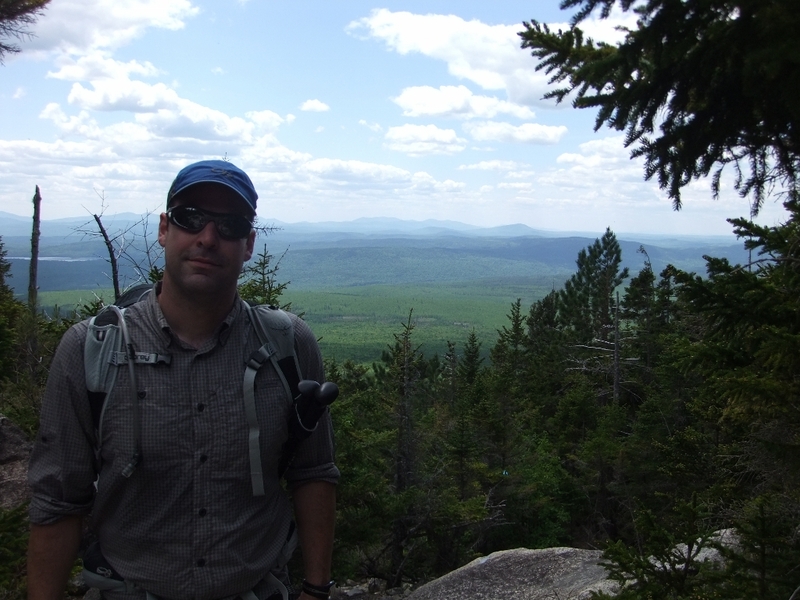 Today’s plan was up Hamlin Ridge trail to Northwest Basin trail. If we had any illusions of not being tired the next morning, the first few steps up Hamlin Ridge reminded us. But the views were spectacular. Ranger Mark had told us that the views coming down Hamlin Ridge on a sunny day were the best in the park, and I am sure he is correct. We’re both looking forward to the day we can make that happen. …. and yet again, WOW! The trail passes over the ridge behind Wade. Ranger Mark had also told us that the climb up Hamlin Ridge wouldn’t be so bad, but that the descent into Davis Pond was “the hardest mile in the park”. Being pretty tired at that point, we were happy to take our time recovering from the climb back up on the tablelands where it was sunny, though pretty windy. We didn’t fully appreciate what he meant by “hardest mile in the park” except that it included extreme steep sections with loose footing and that if we fell it would be more than just a few scratches (his description was much more colourful!). 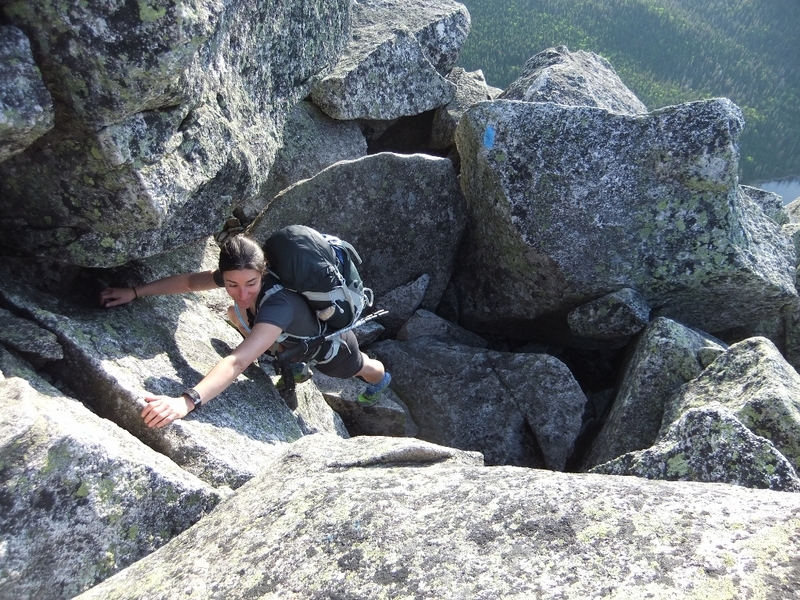 Having climbed up Abol and down Dudley the day before we were having a hard time imagining anything too much harder. Ranger Mark had also reminded us that no one was going to know we were missing for at least 36 hours, unless we failed to turn up back at Chimney Pond the following day. He made us promise to make sure that the message got back to him that we were out safe, or else he’d be coming to look for us. 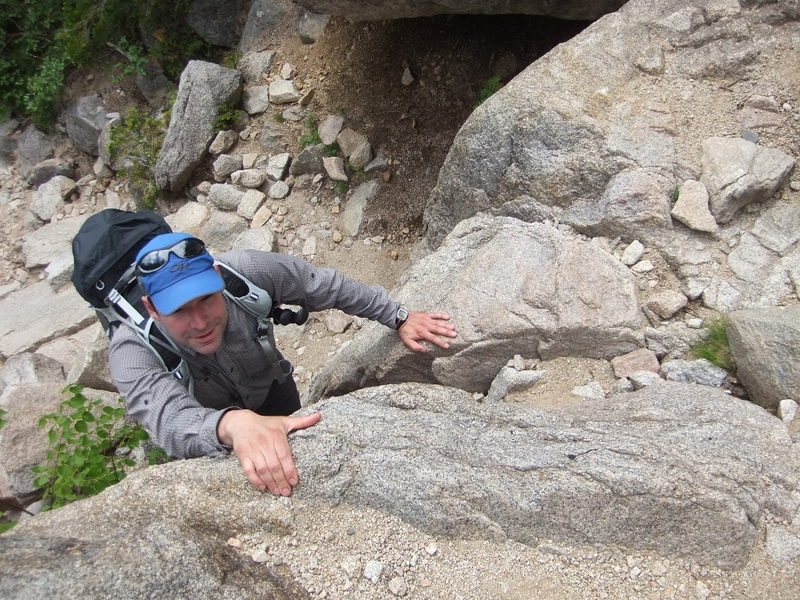 Once we began the descent we kept thinking that the hard part must be just around the corner. 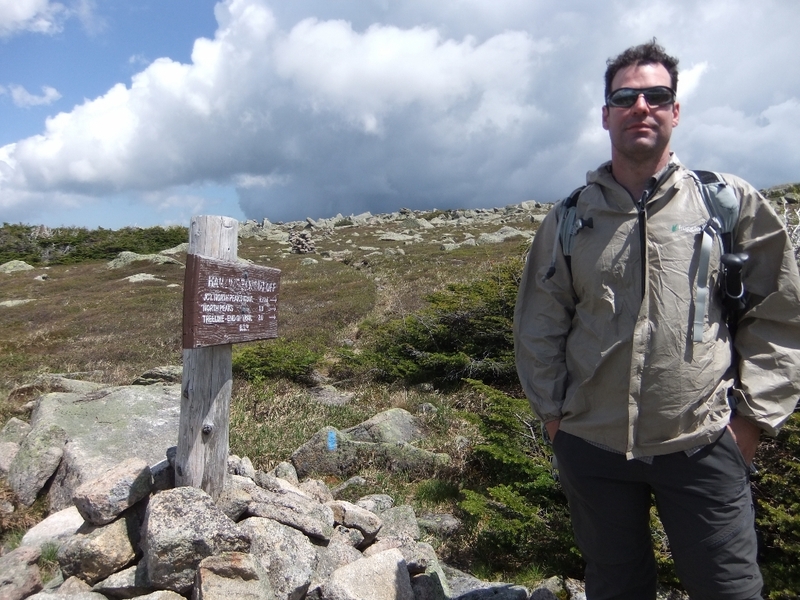 He was right to warn us, but we were thrilled to find that the area, while very different than the rest of the park, is just like good old Nova Scotia terrain (though with way more elevation change!). 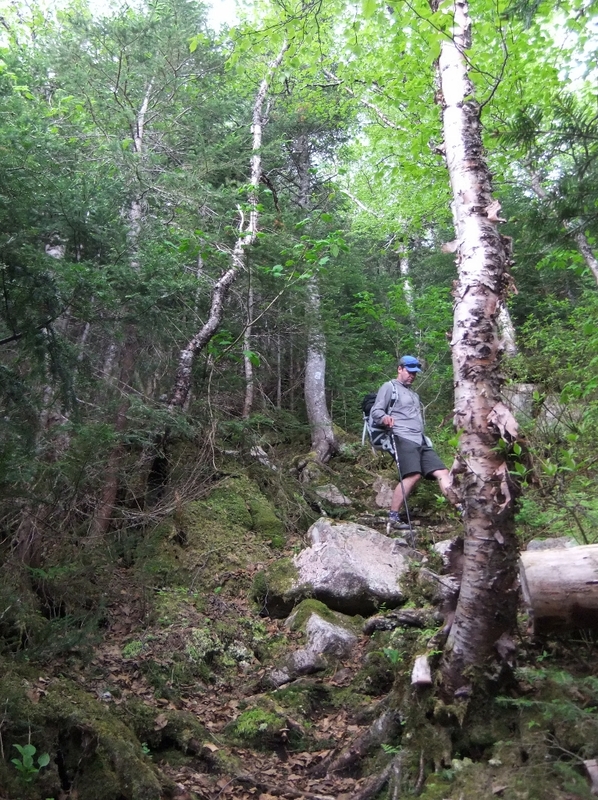 After a brief period of loose boulders it quickly became forested with steep sections, very uneven footing, and slippery exposed roots and rocks. But there were lots of trees and bushes to hold on to, and progress was slow but steady. This was the biggest relief of the trip! As we descended we could feel the temperature drop and in places there were distinct cold pockets. Just off the trail in some of these places were residual patches of snow. Funny contrast to our shorts. 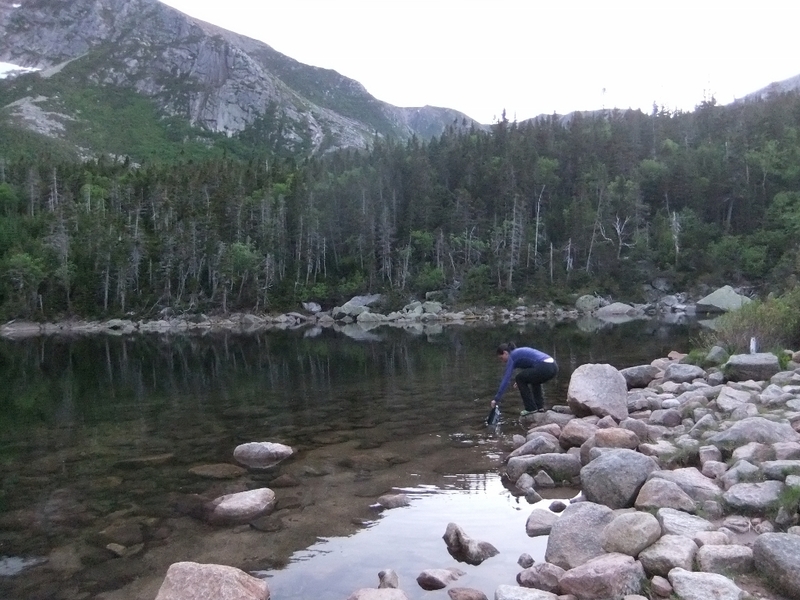 Just a few moments after the descent ended, we had arrived at beautiful but icy Davis Pond! It was only mid-afternoon and we were pretty dirty after 2 hard days. But by the time we’d set up camp and cleaned ourselves up we’d cooled off enough that we couldn’t bring ourselves to jump into the icy water. This would be our first true wilderness night at Baxter. The lean-tos provide ready-made shelter from sun and rain, and make set up so much easier. You immediately have a place to spread out and hang up gear. We were expecting warm temperatures on this trip so we opted for the ultralight option – just a mesh bug net and a few extra pushpins to keep it in place. …and a few minutes later….. voila! 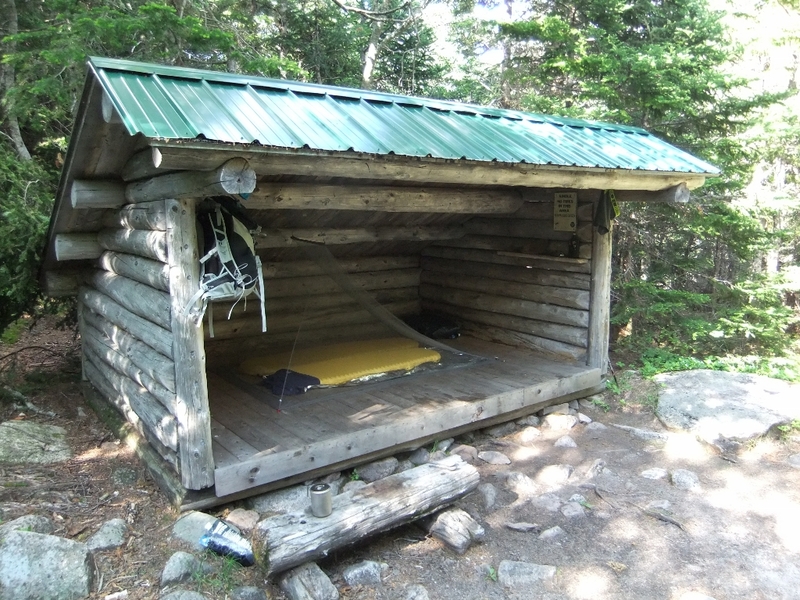 Our luxury accommodations were ready. We managed to sponge off with the cold pond water and had the most amazing nap. Supper was homemade dehydrated chicken stew with rice. 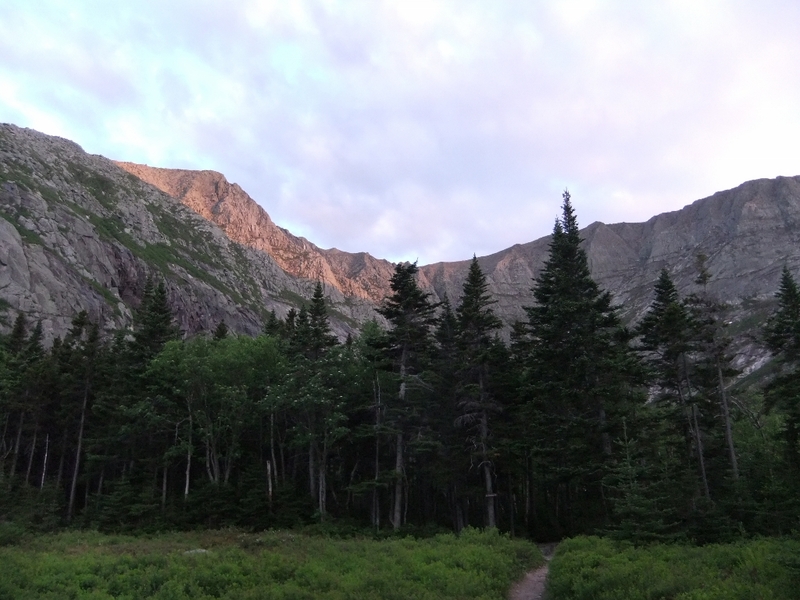 We were planning to hike back up Northwest Basin trail along the tablelands to Saddle trial, then around the Baxter Peak Cut-off to descend Hunt trail to Katahdin Stream campground (and our car!). 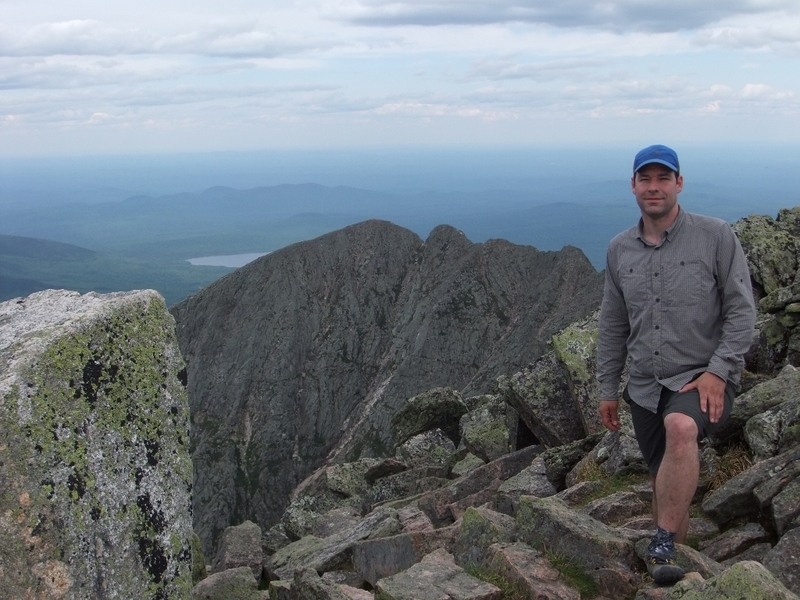 A second trip to Baxter Peak was a remote possibility if the weather cooperated and we were feeling up to it. We woke up feeling great, though somewhat apprehensive about the 1-mile climb back up to the tablelands. 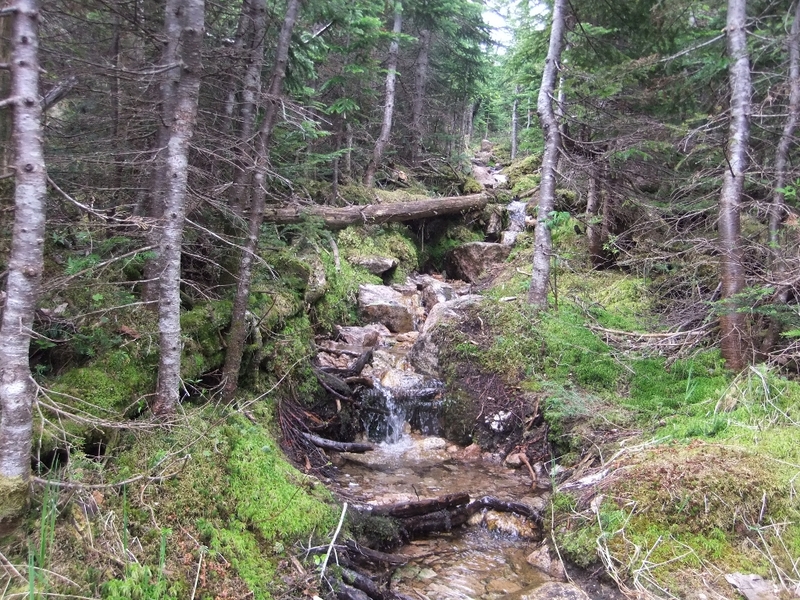 This picture shows where a stream runs right down part of the trail. It’s just as slippery going up but there are lots of trees to hold on to and you don’t have the same chance of falling a long distance if you lose your footing. It was a humid day and by the top of the climb we were hot and sweaty. We stopped a few times to catch our breath, and once up on the tablelands even sat down for a refreshing cold snack of dehydrated salsa (if you don’t know about dehydrating salsa, it’s an amazing summer treat!) and corn chips. 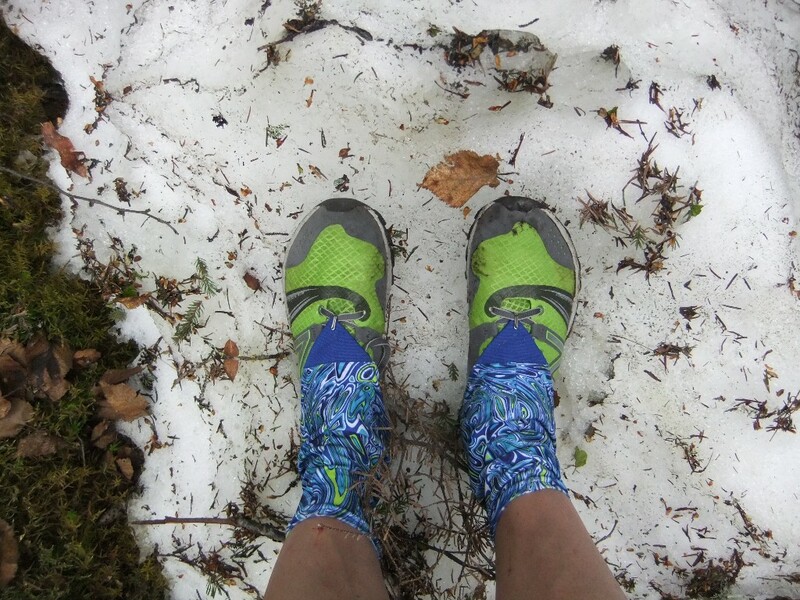 At this point, we hadn’t heard a weather forecast for about 36 hours and little did we know we were about to experience the “rapidly changing conditions” of the above-treeline tablelands. 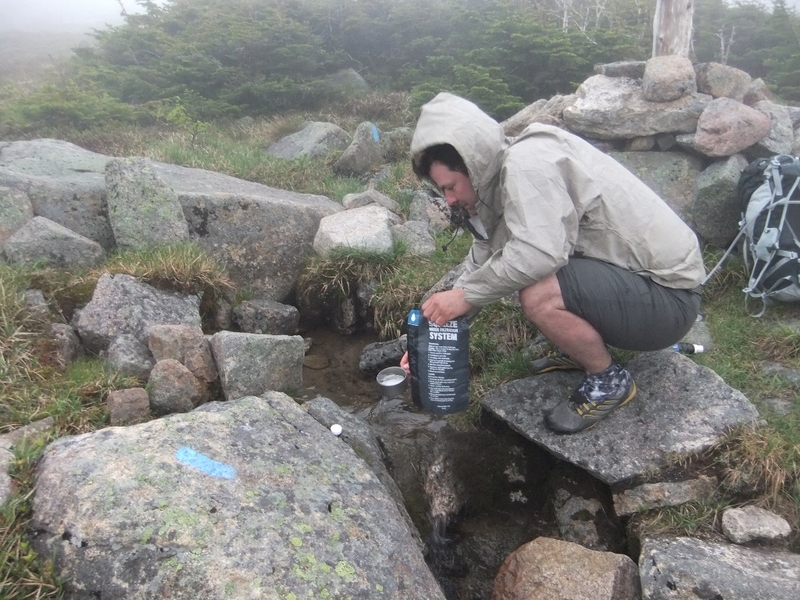 Here is Wade getting water about 30 minutes later as the raindrops were starting. 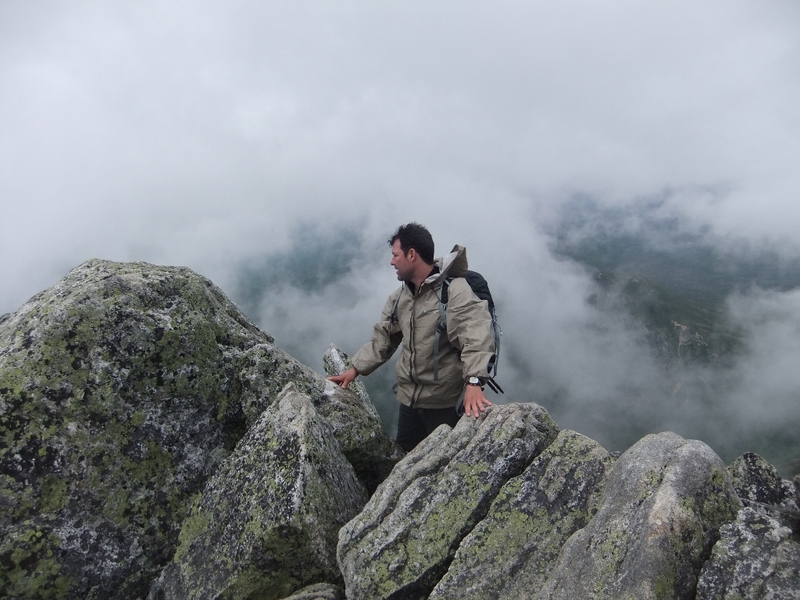 The wind howled continuously and the rain came in waves but the fog drew more dense as we traveled across the tablelands toward the Baxter Peak cutoff. There are stone cairns with blue painted blazes, but these were fading into the mist. 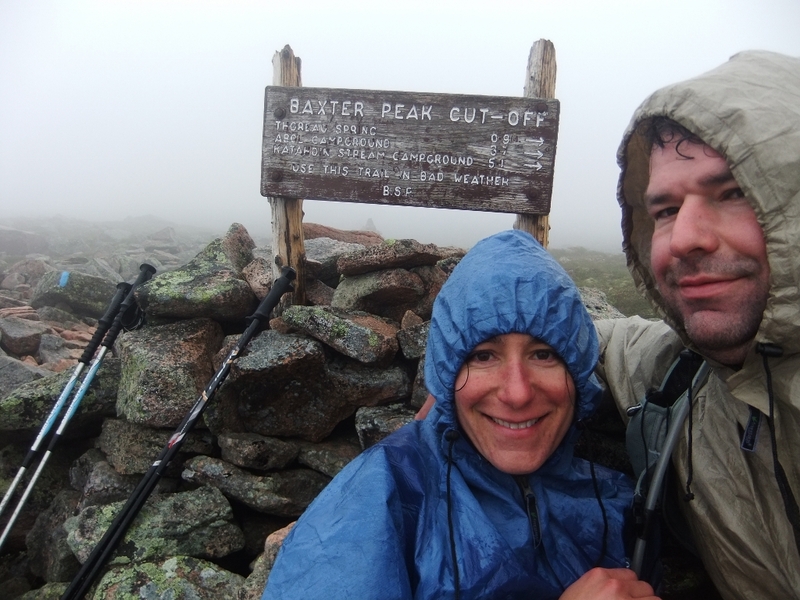 We thought about stopping to set up the tarp a few times to wait out the rain, but didn’t want to extend our time above treeline in case there was lightning, and we were always just able to pick out the next marker in the mist. If you find yourself in this situation don’t allow yourself to follow footpaths no matter how distinct they appear unless you can clearly see the painted blazes – as we found out, you can be easily fooled, though we didn’t go far before retreating to the last painted blaze to reorient ourselves. 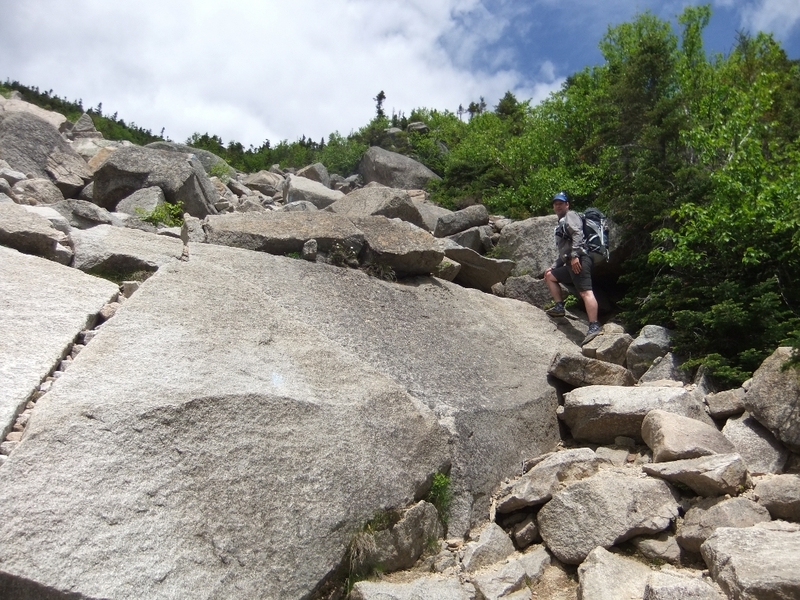 We slowly and carefully picked our way across the slippery boulders. During this time (about 2 hours from the salsa break) the temperature on my GPS watch fell from 22.5°C to 14.4°C (sheltered under my raincoat against my skin). “Hello is it me you’re looking for? Needless to say I stood my ground, as this took me by complete surprise and I had no idea what to make of him. After what seemed like an eternity a small woman popped out from behind the rock. This made me a little more comfortable and I took a few hesitant steps. As I got closer I could see more bodies behind the boulder. It turned out to be a huge group of adults and children hiding from the storm. 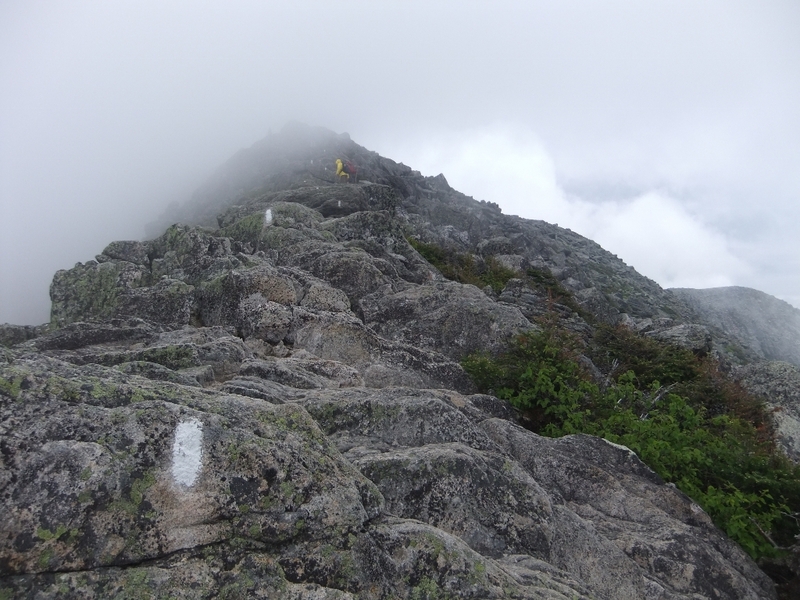 They were trying to get to Baxter Peak via Saddle but the storm had derailed their plans and they were waiting out the rain and hoping that they could find an easier way back down. 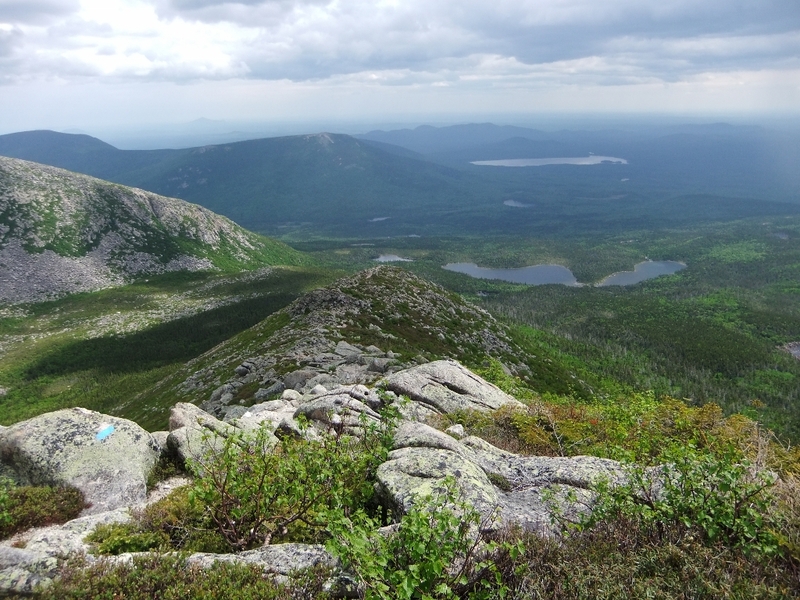 They asked about Hamlin and Cathedral trails and we passed along our understanding that heading back down Saddle would be their shortest and least technical route back to Chimney Pond. They seemed to be in good spirits, so we headed off to find our own shortcut. 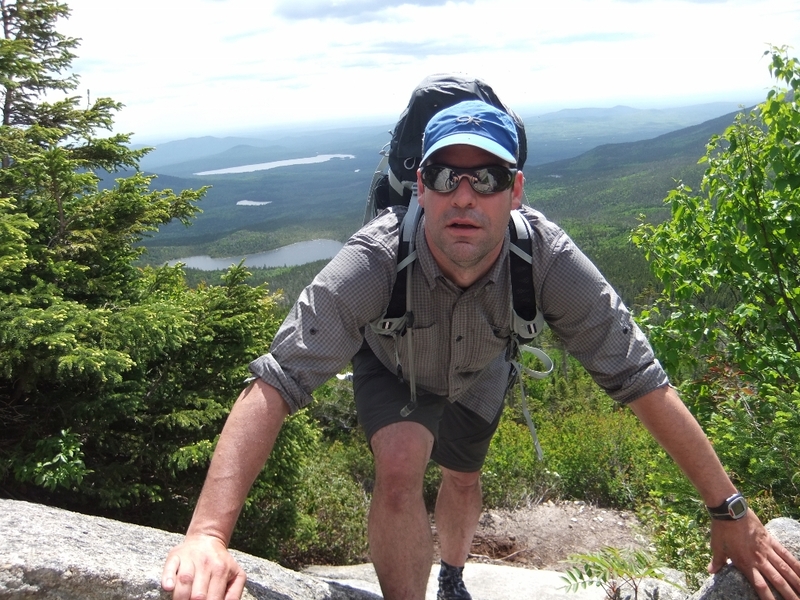 We were off to the Baxter Peak Cut-Off to bring us back to Hunt trail and down to the treeline as soon as possible. The views from the top of Hunt are spectacular, and it was totally surreal as they were fading in and out of the fog. Looking back up Hunt. You can see the blazes are white on Hunt (rather than blue in the rest of the park), indicating that this is part of the Appalachian Trail. Near the bottom some of the larger rocks have smooth patches from the hands and feet of previous hikers. We ran into a hiker from Georgia on his way up who said that this was nothing compared to the beginning of the Appalachian Trail, where the rocks are worn completely smooth in places. Hopefully we’ll get there someday to check it out for ourselves! Almost down. 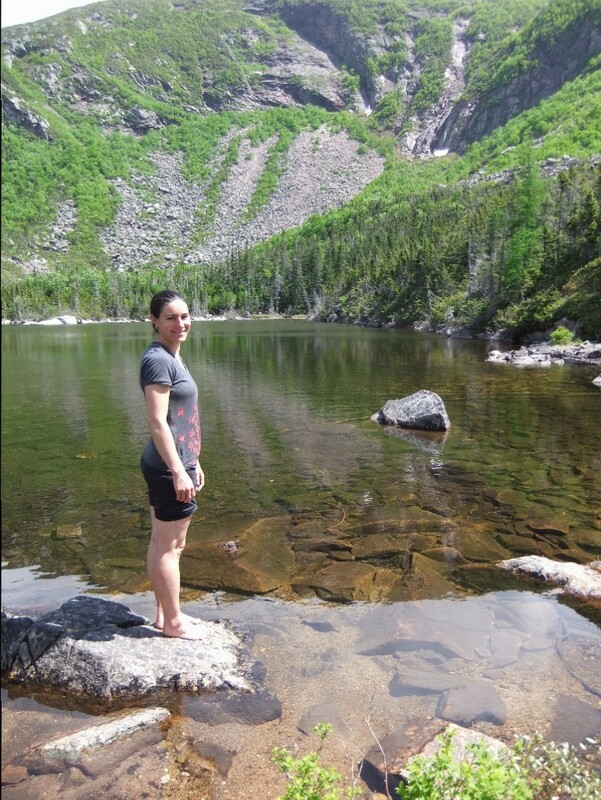 We took a few minutes to rest and soak our feet in the stream just below the Katahdin Stream Falls. 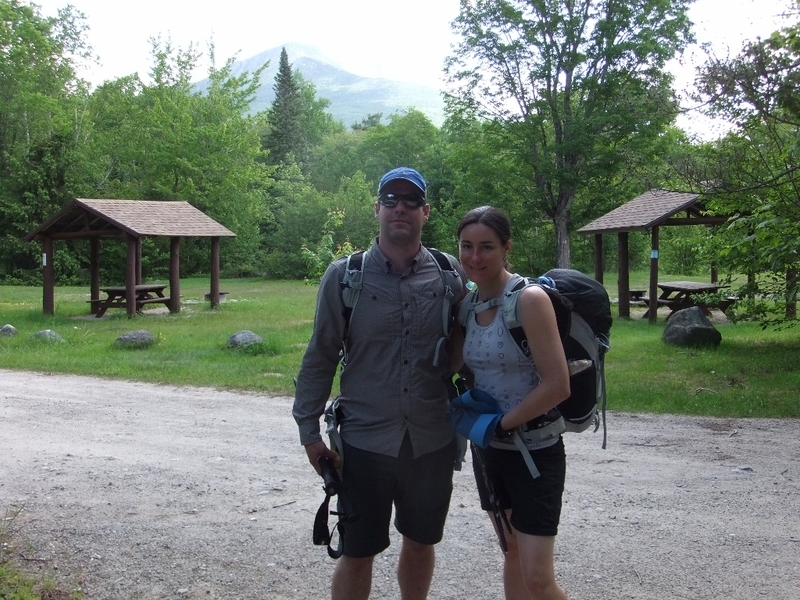 And suddenly we were safely back in Katahdin Stream campground. Tired but still smiling! Looking back on these photos reminds us how epic trip this really was. 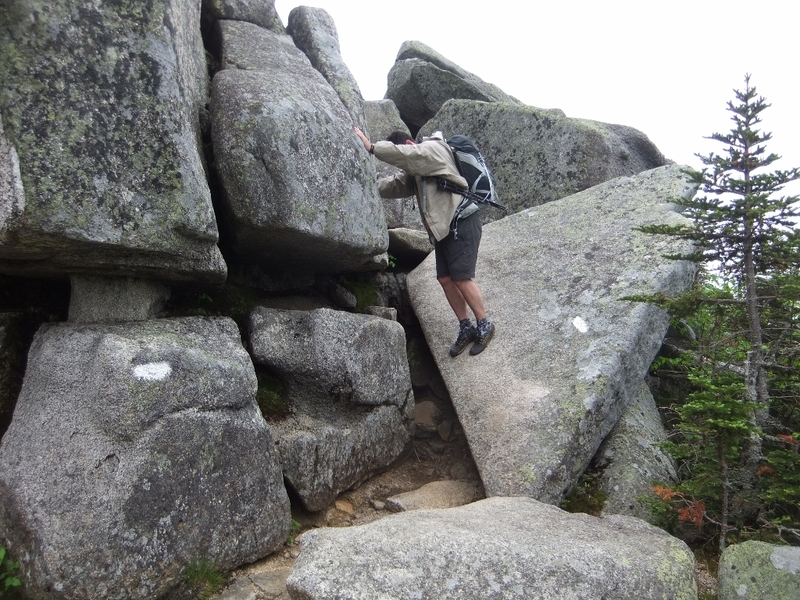 The trip was technically challenging (really hard!) but not over our limits and the weather on the tablelands made for a simply incredible experience. This hugely positive first visit shaped our love for the park, and since that time we’ve returned for three more epic trips to Baxter. Look for the rest of the reports coming soon. This whole trip was a high. This was something completely new for us. Nova Scotia does not have this terrain. The weather conditions were perfect. The storm on the last day brought it to a whole new level and made it a real misadventure. Dudley was the only low, just because it was the end of a very long day for us. We had never done this kind of climbing before and we were mentally and physically pretty much done once we hit the treeline and the trail got slippery and no less steep. We are looking forward to getting back to Dudley to see how it feels on a different day with a fresh start. I make many trips each year up to BSP but I never get tired of looking at other folks’ trip reports. Davis is a lot of work to reach, but definitely worth the risk to life and limb. Don’t trust those trees though. Very little soil on top of the rock there so even good sized live ones can come off in your hands. Good place for a hiking stick or poles. Thanks for the comment. 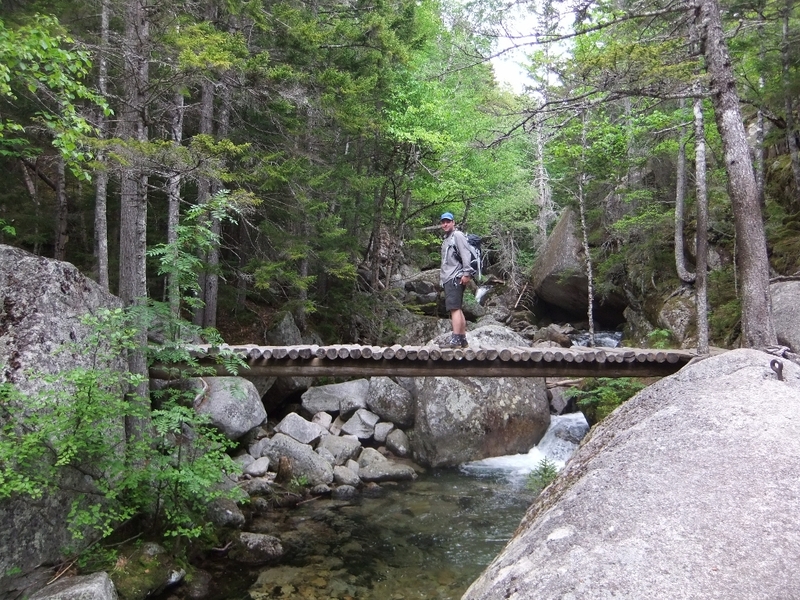 We agree – and one of the photos actually shows Wade using his poles on the way down. It was slippery and steep enough that we often had our hands on the rocks going in both directions, along with the odd tree. According to Wade, “I like to keep low to the ground to minimize the distance of the fall.” Good point about the fragile trees.